China has punished more than one million officials for corruption over the past three years, the government says. Another 409 people, said to be fugitives, have been detained overseas this year. The statistics were released as top officials in the Chinese Communist Party begin a closed-door plenum in Beijing. 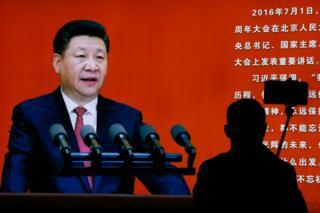 President Xi Jinping has led a wide-ranging anti-corruption drive. But some observers say the campaign has also been used by Mr Xi to purge political rivals, which he has denied. The BBC's Stephen McDonell in Beijing says the secretive plenum will discuss changes to the Communist Party rules. However, analysts warn that some of the changes being considered could give President Xi Jinping too much power, our correspondent adds. According to the party's corruption watchdog, the central committee for discipline inspection, more than one million officials have been punished for corruption since 2013. Those caught up in the corruption drive range from low-ranking officials to top ministers, as well as members of the business and media establishments. China has aggressively pursued suspects who have fled the country in its Sky Net and Fox Hunt security operations. The government says the corruption suspects were guilty of bribery and abuse of power, among other crimes.